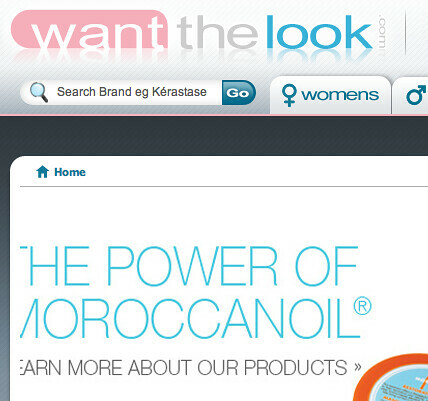 We’ve recently been working on a new website for leading retail brand Want The Look. The fashion retailer was actually quite happy with its previous site in terms of the ‘look and feel’, but knew it was lacking in features and functionality that could really help generate more sales and increase conversion rates. So we’ve been working hard to revamp the site’s homepage and make it more relevant to visitors that arrive on the site. But we’ve also increased the range of value add features that are possible for them to use, for example, loyalty points, gift vouchers, one-click reordering and the ability to run buy-one-get-one-free offers. All of this will help attract more visitors. However, it is some of the work we have done to make the site more relevant to customers that is particularly interesting. For example, you’ll see on the site that there is a big flash banner you are confronted with when you land on the homepage. By looking at the analytics, we could see that many customers were dropping off this page, so we decided to try some different banner combinations to see whether this made a difference. And it did! With this insight, we put in place a clever little solution that takes the keyword a visitor uses when they come to the site via a search engine and then shows them a banner that corresponds to this search term. So, for example, if you come to the site from a search for GHD, you’ll be confronted with a banner advertising GHD straighteners. If you come following a search for Kerastase, you’ll get a Kerastase banner. Simple really! And with some clever coding behind the scenes, it means that we are seeing very impressive conversion rates as a result. This is a very integrated approach and because Want The Look also works with our dotSEO and dotMailer teams, we have been able to make recommendations about their whole digital strategy. Some of which has already been implemented, but a lot more that is still to come. So check out the new site, but also watch this space!